This past week during our vacation at Deep Creek Lake with our friends J, Erin, and Nora, Zoe and Nora became friends! Nora is nine months older than Zoe and they have interacted many times before, and acknowledged each other, eaten together, and definitely shared toys. But this week they shared a room! And they liked it! Upstairs the grown-ups laughed at our girls giggling, until eventually we would send down an emissary to remind the girls that it was time to sleep. Usually we had to do this two or three times. Then every morning we would all wake up, sometime between 6:30 and 8, to similar cute conversations and giggling coming from the room downstairs. It amazes me that neither Zoe nor Nora ever got out of bed or yelled or cried for us to come downstairs. They just woke up and resumed their conversation or sing-along from the night before. It’s a much cuter sound to wake up to than an alarm or NPR. For Father’s Day I took my dad for his first pedicure. It was actually the Friday before Father’s Day, because we were leaving for vacation on Father’s Day proper. My dad expressed concern that this was not something men do. I assured him that some men do get their nails done. Including straight men who are in their 60s. He went along with it, which I was glad about because he’s hard to shop for. He has everything and professes to want nothing. He loves books and music but sometimes it’s hard to feed someone else’s addiction. So I took him to the nail salon I’ve been going to for years and signed us up for manicures and pedicures. I had my eyebrows done too, but I didn’t insist that he join me for that. It would have been too much. While I was getting my brows done the woman who was doing it bluntly asked “Who’s he?” and I explained he was my father. We sat next to each other while they were doing our feet and chatted about politics, current events, and family stuff. The women smiled at us. The woman doing his feet asked if he wanted hot paraffin wax. He looked at me. I said “sure, why not?” so she encased his feet in plastic baggies filled with pink wax. She did not, as my mother wanted to know afterward, make any comments about the condition of my father’s toenails. Before this experience his toenails were, to put it diplomatically, not especially well-groomed. My dad particularly enjoyed the foot and leg massage part of the pedicure, which is my favorite part as well. Afterward he said several times his feet felt springy. He had a manicure as well, which was not his first. He had been taken by my mom to get manicures prior to my and my sister’s weddings, which was a good thing. His fingernails are typically not especially well-groomed either. He said he enjoyed the whole thing and did not feel too girly, but rather energized and relaxed. I was pleased. Father-daughter manicure/pedicure seems like a good tradition to me. For a man who doesn’t play golf or use power tools, it’s nice to find a new way to celebrate Father’s Day. Zoe has been going to a new day care provider for a couple weeks now. Her name is Inoka and we love her. I fervently hope we will continue to love her until it’s time for Zoe to go to full-time preschool. Inoka is the third day care provider Zoe has stayed with since starting in day care two days a week in January 2008, when she was nine months old. I have agonized, hemmed, hawed, fretted, and generally freaked out every time we’ve had to make a decision about child care. Twice before we found providers who seemed great, but then their circumstances or Zoe’s needs changed. One provider had to leave the country for a few months, and also seemed to question my parenting abilities, which I didn’t appreciate. Another provider moved the kids to a smaller room and ended up with several babies to care for which left little attention to devote to Zoe. So we moved on. The third time around I interviewed several providers, armed with a checklist and greater confidence in my ability to advocate for my child’s needs. At least I’ve learned something throughout this process. The whole concept of asking a stranger to help raise your child is complex. When I was growing up, my mom stayed home with us. She did work part-time when we were in school, but she was ALWAYS there when we were home. The only time I ever remember her not being home when I came home from elementary school was when she was in the hospital giving birth to my sister. So I always assumed I would be a stay-at-home mom too. I had friends whose moms worked, and they all turned out fine, but I liked the way our family worked and wanted to perpetuate that. It turns out that it’s not so easy. Very few of my friends are stay-at-home moms. I know MANY work-from-home moms, like myself, but they are still working and generally still need someone else to help care for their children. It turns out that most of us need to work in order to pay the mortgage, and staying at home full-time is not an economic option for our families. I have made a few friends, primarily through Zoe’s preschool, who are stay-at-home moms. I have to remind myself not to be envious of their situations. Truthfully, I enjoy running my own business and I love my work. (Most of the time). I also love my daughter and love spending time with her. But I think if I were with her on my own for her 12 waking hours every day I would go insane. Of course, if that’s how it worked in our family, I would do it. But I think it’s best for everyone’s mental health that I work some and take care of Zoe some. For Zoe’s part, she adores spending two days each week with my parents–mostly my mom. And I think she enjoys spending two days each week with a day care provider and some kids her own age. Inoka is the first day care provider I’ve met who actually follows a curriculum. Zoe comes home with art projects, traced letters and shapes, and coloring pages. They sing songs. They play games. It’s good stuff. It’s more like preschool than her preschool was this year. On Tuesday afternoon it wasn’t raining so I walked to Inoka’s house with an empty stroller to pick up Zoe. On the way home Zoe looked up and back at me and said with a big smile, “I missed you SO MUCH!” Which is always nice to hear. If she weren’t with someone else all day, how else would she miss me? I noticed an inscription by Walt Whitman in the stone wall that covers the North entrance to the Dupont Circle metro. I have ridden the DC metro, and entered and exited at that stop, many times. I have NEVER seen the inscription before. It’s a quotation by Walt Whitman, dated 1865. It’s about visiting wounded soldiers in the hospital and holding their hands and bearing witness to their suffering. I never knew Walt Whitman did such things. And why did the builders of the metro system choose that quotation to inscribe above that stop? And do other people know it’s there? Tonight I witnessed a grown woman bullying another grown woman in front of a room full of other grown women. All professionals. All theoretically peers. Certainly the bully held a slight position of power, but that did not justify or excuse her behavior. After a long and fruitful discussion among all the individuals there, just when I thought it was safe, one woman began to badger, scold, and verbally stomp on another. The victim did her best to hold her own, answer the unreasonable questions reasonably. But there was not much to be done. Why do grown-ups behave this way? Was this woman still compensating for something done to her as a child that she had to mistreat another grown-up in a professional setting, as if she were a child, but certainly with less patience or kindness than one would hope a child would be treated. It was difficult to witness. The woman sitting next to me was holding her head in her hands. I interjected a couple times as much as I thought was appropriate for my role there. But it didn’t matter. You tend to think of overgrown bullies as big, loud men who yell or hit or break things. But they can be smart, petite women too. My sister Susannah and my brother-in-law Aaron are leaving their Long Beach apartment today for a summer-long road trip. They have lived in California for the past several years while Aaron was working on his PhD in English at UC-Irvine (Home of the Anteaters-ZOT ZOT ZOT) and Susannah was a reporter for the LA Times. Aaron has graduated and Susannah has been laid off (the 365th person to be laid off but the only one to request a meeting with the editor of the paper about it) and they’re packing up and moving out. In August they’re moving to Taiwan for a year, where Aaron will be teaching at the National Tsing Hua University in Hsinchu. Between now and then, they will be traveling through the US visiting friends and family and attending weddings. They will be here in early July to celebrate our parents’ 40th wedding anniversary. I know this move is exciting and nerve-wracking for them and that they love Long Beach and are sad to leave it and the friends they’ve made in California. I’ll be thinking of them a lot this summer as they travel. This is the (excerpted) poem by Walt Whitman that I read at their wedding, and I think it’s especially appropriate now. Afoot and light-hearted, you take to the open road. The long brown path before you, leading wherever you choose. Henceforth whimper no more, postpone no more, need nothing. Strong and content, you travel the open road. However sheltered this port, and however calm these waters, you must not anchor here. You will go where winds blow, waves dash, and the Yankee clipper speeds by under full sail. The road is before you! It is safe – I have tried it – my own feet have tried it well. Zoe has become a singer! Her repertoire includes “Twinkle Twinkle,” “The Alphabet Song,” “Happy Birthday” (a favorite), “Ring Around the Rosie,” “Jingle Bells,” and the first line or chorus of “Peace Like a River” and “Little Red Caboose.” For a few weeks she was just belting out every song she could think of at the top of her voice. We had read that little kids do not sing on pitch when they first learn to sing so did not immediately jump to the conclusion that Zoe had inherited her mother’s vocal gene that had to be overcome with voice lessons. But in recent days Zoe has modified her singing somewhat, occasionally singing falsetto and sometimes singing in key, which is fun. She loves to sing to herself, to sing to us and with us, and for us to sing to her. At bedtime she favors “Amazing Grace” as an encore and surprised me the other night by singing along with me, at least for the first verse. Randy tried to sing “Amazing Grace” one night and didn’t remember all the words so afterward Zoe called him on it. “Daddy, you don’t know that song.” Sometimes she says to him “Daddy, can you sing better?” which I have tried to reassure him probably means that he’s not singing something the way she is used to hearing it, not that she’s commenting on his vocal quality. When I sing “Amazing Grace” I say “soul” instead of “wretch” because I learned that version a few years ago and like it better. One night when Randy was singing to Zoe he said “wretch” and she quickly corrected him, “NO Daddy, it’s SOUL!” I had no idea she was paying such close attention. 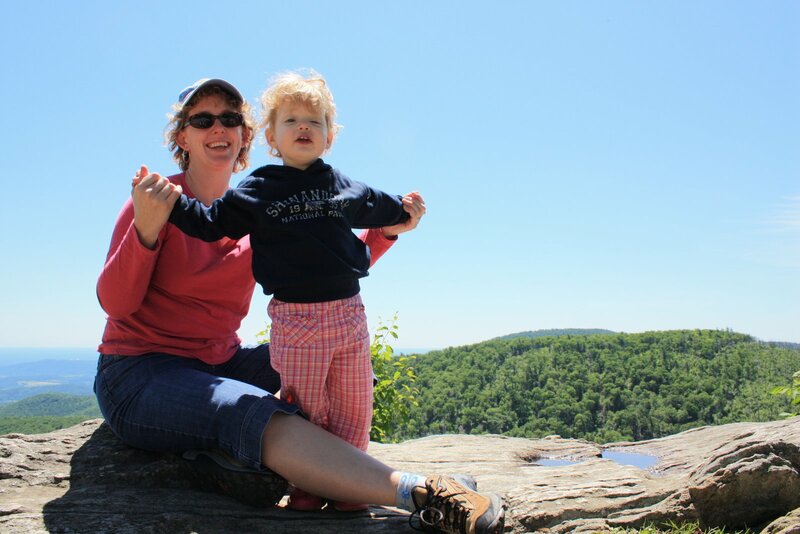 This past weekend Zoe went on her first camping trip, to Big Meadows in Shenandoah National Park. I am not a natural-born camper, but Randy has more of the camping gene, and I wanted to make use of the equipment I bought for the Avon Walk for Breast Cancer last month. So we reserved a campsite, borrowed a tent from our friends Liz and Annette, and headed down Skyline Drive. Zoe was a great traveler. She enjoyed our picnic and playing with a ball after lunch. She enjoyed spotting deer throughout the park. “Do you see the deer, Zoe?” “There’s a mommy deer and a baby deer and a daddy deer.” No matter the size or shape of the deer or what we said about them, every pair of deer to Zoe was a mommy and baby deer. When we were setting up the tent Zoe asked if she could help. We tried to find things for her to do. When we finished setting it up and she climbed in she exclaimed “I’m going to like camping!” In the afternoon when we were exploring the park and stopped by a camp store Zoe requested vanilla ice cream. While Randy was paying for our treats Zoe suggested “Can we go outside and sit on benches and eat our ice cream now?” We thought that was a good idea.